Bangkok Peppers Too...Thai Cuisine! Dine in or Carry Out. Colorful BBQ joint known for pulled-pork sandwiches serves up craft beers & live blues on weekends. 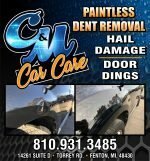 Short Business Description: Auto dent removal service in Fenton Township, Michigan. Address: 521 North Leroy St.
Café of LIFE Chiropractic is a place that will help shift your awareness towards a more vitalistic and holistic way of living. The Café will empower you to take responsibility for your own health. We realize that more and more people are interested in understanding how to take care of themselves and their families, and get more out of their days. At the Café, we serve these needs with ongoing education and information. Our intention is to lead people to their highest possibility. Crossfit Fenton is a full-service CrossFit training facility. We offer weekly classes both monthly membership and drop in welcome. We are open Monday through Saturday with morning and afternoon classes for all age and skill level. We specialize in high-quality coaching focused on form skill and the health of our athletes. Come check out our CrossFit gym in Fenton, Michigan and community today! CRUST is a full-service retail and wholesale baking company located in downtown Fenton, Michigan. Large glass windows look in on the busy kitchens and showcase the classically trained bakers at work alongside an impressive bread oven from Verona, Italy. While most of the building is dedicated to production, a small retail space is modeled after bakeries the owners visited in Montreal, Toronto and New York. The long and short of it, this building means more than bricks and mortar to a lot of people. As the Fenton Fire Hall Taproom and Kitchen, we're out to respect the building at every turn and deliver the kind of grub that's as honest as the building its served in. Woodfired grill. Legendary Mac & Cheese. 48 beers on tap. Short Business Description: Buy Ford OEM Parts online. Search the entire Ford OEM Part catalog and easily buy Ford parts at discounted prices and get them shipped directly to your doorstep. You can easily search ford Ford parts using pictures and diagrams to find Belts, Hoses, Brakes, Alternators, Exterior Accessories, Interior Accessories, Body Parts, Floor Mats, Electrical Parts, Oil Filters, Fuel Filters, Spark Plugs, Wiper Blades, and so much more. Grand Blanc Mitsubishi is the premier Mitsubishi dealership serving the Grand Blanc, Michigan area including Flint, Saginaw, Lansing, and Detroit. The Lasco family listened to customer over the past 5 years of selling used vehicles out of their Grand Blanc, Michigan dealership Lasco of Grand Blanc and decided to take action based on the feedback. The common discussion with most clients looking to purchase a used cars for sale in Grand Blanc MI was that they would also consider a new vehicle but it needed to be in a affordable price range and carry a great warranty. After searching for the perfect manufacturer fit, the Lasco's were able to acquire the perfect brand to accommodate their customers, Mitsubishi Motors.